During Disney’s slump in the early 2000s, the famed animation studio tried its hand at some unfamiliar territory to try and win back audiences from competing animation studios and their CG films. Disney’s tradition of colorful musicals all but disappeared, and they started producing some more action-oriented features during this time. 2002’s Treasure Planet is one such feature. Although Treasure Planet became a bomb at the box office, it features enough creativity and character to lift it above some of Disney’s other films of the time. Treasure Planet is a retelling of the classic story Treasure Island, but reconfigured into a science fiction setting. A young man named Jim Hawkins (Joseph Gordon-Levitt) grew up hearing the stories of the notorious pirate Captain Flint, and the insurmountable wealth he kept in a mysterious world called Treasure Planet. One day, a dying space sailor gives Jim a chest containing a strange orb, warning Jim that a gang of pirates lead by a cyborg are after the item. Jim soon learns that the orb is indeed a map that points the way to the fabled Treasure Planet, and he, along with his dog-like friend Delbert (David Hyde Pierce) recruit a crew for the expedition. The crew consists of Captain Amelia (Emma Thompson) and her trusted First Mate, Mr. Arrow, as well as a band of more unsavory figures, including the ship’s cook, Long John Silver (Brian Murray). It’s no secret to anyone who knows the story of Treasure Island that Silver is the one-legged man (or cyborg, in this case) who plans a mutiny and steal the map. Treasure Planet does a decent job at retelling the story, with the relationship between Hawkins and Silver being a strong point. Under his rouse as a kindly cook, Silver and Hawkins form a kind of father-son relationship, and both gain a mutual respect for one another, even after Silver reveals his initial intentions. 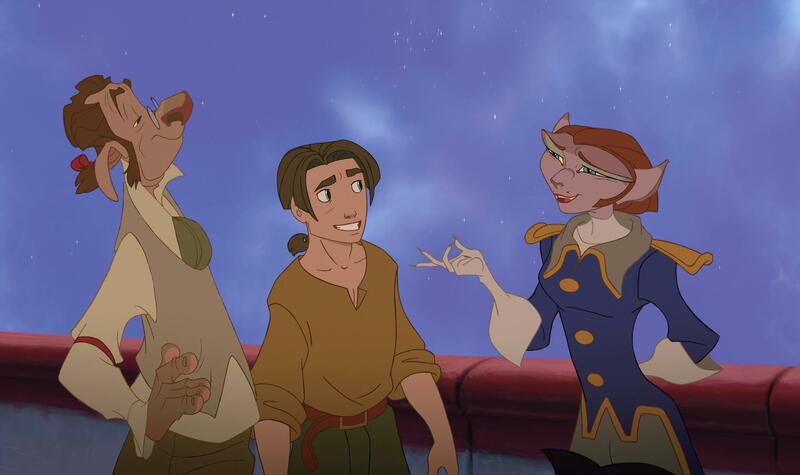 The fluctuating friendship and rivalry between the two is well reflected in Treasure Planet. The film is well animated for the most part, with fluid, energetic visuals and fun character designs (particularly with the alien creatures). There are some moments where the hand-drawn characters and CG backgrounds clash a bit too much, but overall the film is pleasant to look at. Treasure Planet also includes some top notch action scenes, with the finale being especially exciting. The film takes advantage of its animation and setting to provide a series of fun action sequences. It may have benefitted the movie to have a couple more breathes in between these action scenes for additional character development, but I’d be lying if I said it wasn’t fun. I suppose it’s necessary to address the elephant in the room: the sci-fi setting. As previously stated, placing Treasure Island in the depths of outer space is an interesting concept that makes for some good action, but is it also a bit gimmicky? It can be a bit distracting in the film’s earlier moments, and even once you get used to it, you may still wonder if a more direct adaptation would have worked better. It’s a nice twist in some ways, but it can be off-putting in others. Treasure Planet holds up better than similar Disney movies of the time, such as Atlantis: The Lost Empire, since the movie’s core relationship keeps the story afloat and the action scenes are well done. But its whole schtick can come across as something of a gimmick, the animation techniques don’t always mesh, and the story could dedicate a little more time to the characters. It’s a more solid entry in the Disney canon than its contemporaries were, and better than its box office performance suggests, but it ultimately didn’t have the extra oomph Disney needed to get back into the game. Strangely, the absurd sci-fi setting is my favorite part of the movie. It makes the whole journey beautiful and awe-inspiring. It does indeed add some flair. But I also understand the counterpoints that the movie may have been better remembered without the sci-fi setting. It’s certainly a fun twist, but with the way Disney often ends up with the most iconic versions of classic stories (IE Peter Pan) one has to wonder if Treasure Planet could have joined those ranks as Treasure Island. The scifi setting is called steampunk. That’s your problem of finding it gimmicky and and distracting. And besides, Treasure Island has had many movie adaptations before Treasure Planet came out and it didn’t need to be told the exact same way as the story it was based on. Because if they did put it in it’s normal setting, it would’ve been cliche, boring, and unoriginal. Treasure Planet deserves a much, much higher rating than a 6.5 because to me, that’s saying you find this movie mediocre. 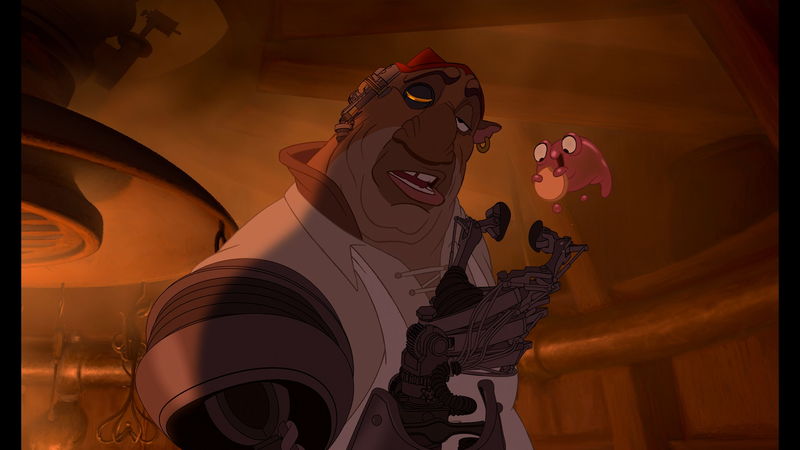 I wouldn’t necessarily call Treasure Planet steampunk. Steampunk would imply a quasi-futuristic setting built on 19th century aesthetics and steam engines. 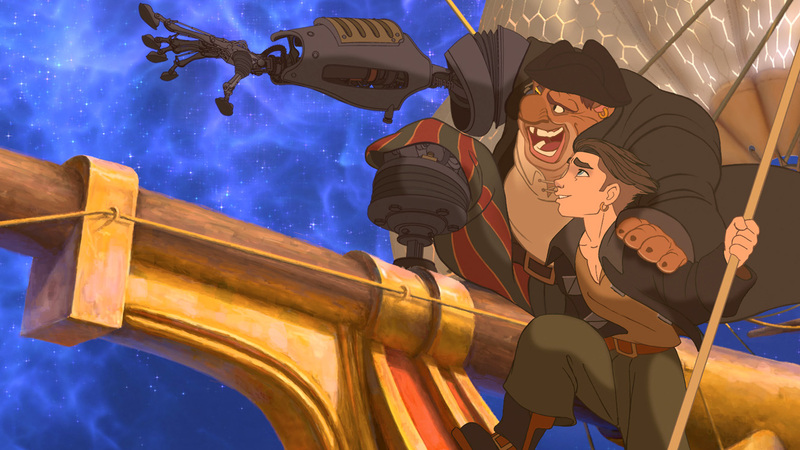 Treasure Planet is full-on sci-fi, but with traditional pirate elements. Disney making a more traditional Treasure Island movie wouldn’t have necessarily made it cliche (though that could have been a possibility). After all, there were other adaptations of stories like Beauty and the Beast before Disney had a go at them, and Disney managed to make them standout. A lot of people seem to think “6.5s” and such ratings are bad, and it’s true that many people have reinforced this over the last decade and a half or so. But I got tired of people turning 1 to 10 scales into “7 to 10” scales, where anything less than a 9 was considered disappointing and anything less than an 8 was made out to be bad. I try to acknowledge that a 6 is still in the upper tier of a 1 to 10 scale, and shouldn’t be seen as a bad rating. Yes, there are better scores on my list, but I try to make sure that a 6 doesn’t come off as bad. I think Treasure Planet is a good movie, I just think it has some elements holding it back from being an even better one. I understand. As long as you say that it’s a decent movie, that’s all that matters to me. I actually didn’t hate this movie like most people did. It wasn’t the greatest, but I enjoyed it. Wizard Dojo Create a free website or blog at WordPress.com.